...down to the cardboard box recycled as mailbox decoration. Portable dishpans gave every kid room to build towers and cars. 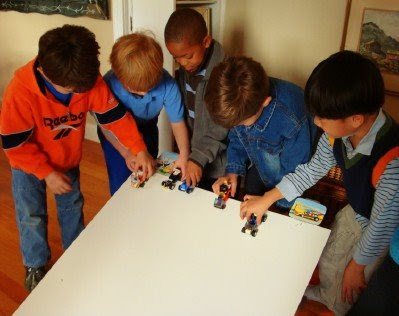 Have a scrap board you can use for Lego races? We awarded prizes for Longest Car, Wackiest Tower, Best Teamwork, etc. 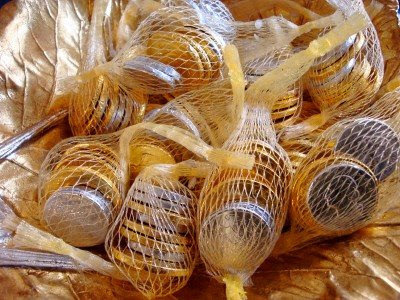 Gold coins (10-cents/bag after Christmas) made perfect medals. Have a bunch of minifigures, but no time to frost the traditional Lego cake? In less than 10 minutes and under 10 dollars, we put together a fun--and chocolatey--alternative. Click here to read the complete series on planning the ultimate LEGO birthday party! What you did to the mailbox is just darling!! 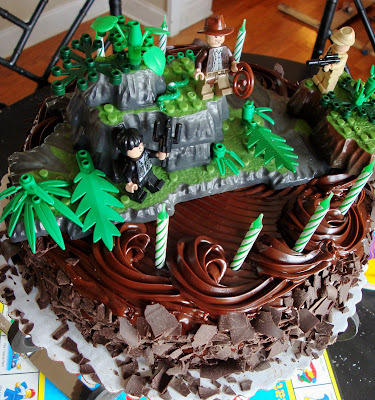 I love how you had a really cool cake that didn't require hours of tedious decorating (at least not for you). You are always so clever! I just love reading your blog! You inspire me to be more creative! I like YOUR lego cake much better! Good job, Meredith and Andrew. I am just so impressed Meredith. I have been racking my brain for a birthday party theme to come up with to share between my daughter who turned 3 yrs. and my son who turned 5. I finally got them convinced for a home party...But now the squabbles are because of sharing the special day together. Both birthdays are two weeks apart. I had to wait till my dh and our employees cam back from working in KY. You give me a boost today after seeing this that I can put my thinking cap on and do this frugally. absolutely LOVE the mailbox. The party starts well before you hit the house, and makes them crazy excited! Did the guests see it and comment? Hope you had a very happy birthday, Andrew! You know why this post also seems so neat, Meredith? You seem like a very gracious, warm hostess, whether it's adults or children you are entertaining, and I am sure that anyone that comes to your home leaves feeling loved and ministered to. I think your blog reflects that, too! That's why we all love stopping by here, each and every day! You are nailing the details, and I bet every boy there was wishing HIS mom would just let him play Legos with his friends like you do! I love birthday parties where the kids get to do what they really want to do -- play with each other! Oh my gosh...what a FUN PARTY! I love the Lego mailbox...what a riot! Perfect party...especially for that age...I bet they couldn't have been happier...and busy! Great job...thanks for sharing. Okay that red box over the mailbox..is just too too creative...love it! Send that to family fun magazine...you must! Boy, I sure wish my boys were into Legos! Do you think I could pull off a Lego party anyway? Even though I only have two girls, they are into both "girl" and "boy" things, and they would love this lego party ... I think I'll do that this year. For those with girl questions - How about a girl's princess tea party - scour the local thrift stores, especially those that offer 50% and 75% off a certain color.... sometimes you can pick up a tea cup and saucer for a quarter! My girls (now ages 5 and 7) like to play dress up and sip "tea." I've found hot apple cider makes an excellent substitute for tea and hot chocolate is a great sub for coffee. Make them feel grown up ... they will love it. Also, I was at Michael's Arts & Crafts Store the other day, and they had some Martha Stewart Crafts party kits in a box that are regular $17 marked down to $6 - they included the plates,cups, napkins, silverware, and some decorations. 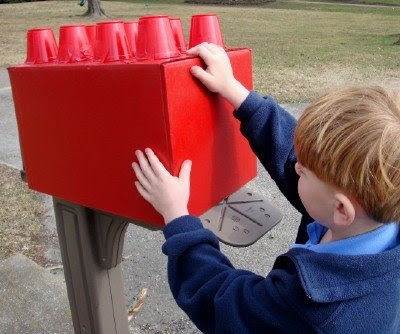 I love, love, love, the lego mailbox cover! 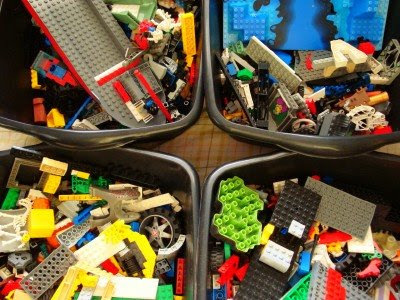 That is the coolest idea ever and I love the dish tubs filled with Legos for each child. If they gave out cool mom awards you would totally win- hands down :) Bookmarking!! That looks like a really fun party! I absolutely love the Lego mailbox! You're so creative! Fabulous! The stuff little boys' dreams are made of! You are one amazing mom. I love this!!! You did an awesome job Mama! yay! it turned out great, meredith! quick and easy! That is some great curb appeal, Meredith. Nothing like a Lego mailbox! Love it, I am a fan of decorations that can be played with. I love it! Both of my kids are into Legos in a big way. In fact, if you walked down into my basement right now, you'd swear I was having a Lego-themed party. They've taken over! What a fabulous, fabulous idea...actually TONS of ideas for a little boys Birthday. LOVE IT! Your Lego Party ideas are just awesome! My son will love this for his birthday! Blessings to you! I so heart you. Where were you last month when I spent almost $1000 at one of those silly birthday party places. And this looks 10 times more fun! Today at Big Lots I saw boxes of Lego fruit snacks for $1.70. Each box contains 10 little packs of lego shaped "fruit" snacks. Wow, that would be 17 cents for each party favor! I know that these are not nutritionally sound, but in the interest of a li'l boy's birthday, they sure are cute. Really, really great. I love it.